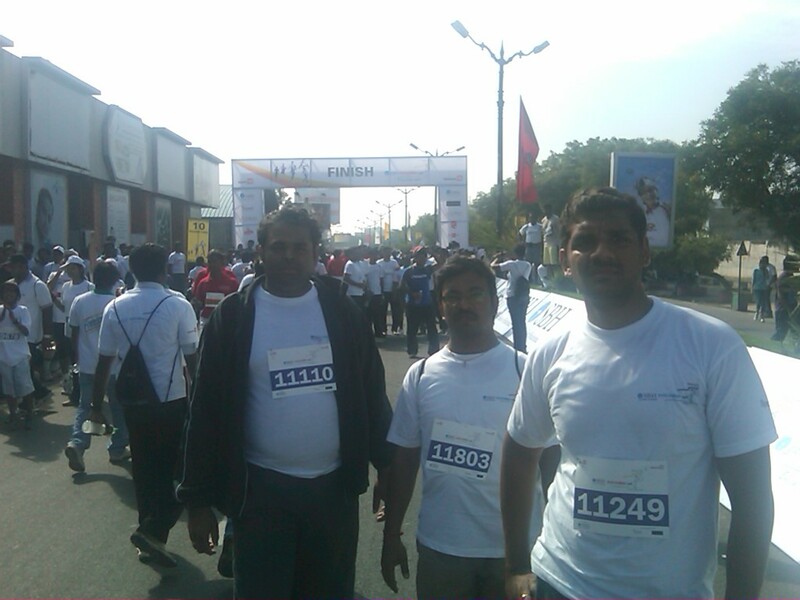 10K, the run that was walk! It is something of a great achievement in one's life to be able to give a TED Talk. Am really happy for you and may the new year take you to even more greater heights in your career. On 28-Nov, there was a 10K run for all folks... Though not a health freak, wanted to do something different and got on to the bandwagon. The run was supposed to be at 7:00 AM for all, but the organizers felt that the corporate types would make more of a nonsense factor to the run, so they kicked off the "professionals" race and it was a delight to see the winner breeze past me as he clocked less than 30 minutes for the run. That guy was real skeleton, with skin and clean shaved his head to counter the air resistance... seems aerodynamics have gone to runs! Once the professionals were done with their stuff, we the "fun run" types were flagged off! All along the way, there were kiosks of Glucone-D energiser drink, kingfisher water bottles to rehydrate the dehydrated walkers/runner, while the musicians like folks artists to Jazz players entertaining the junta and participants en route. 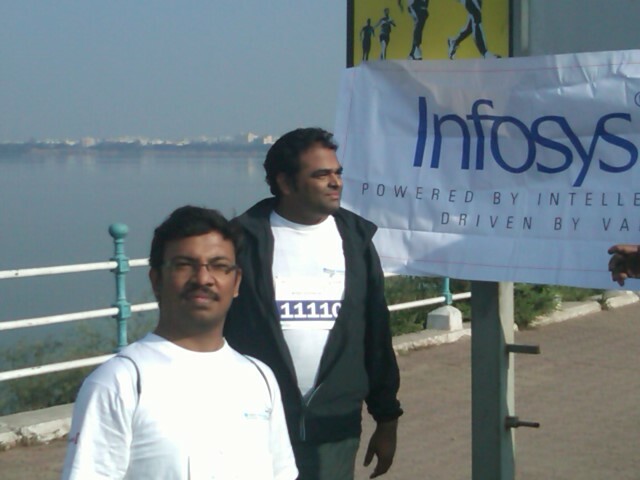 At every 3 Kms, the Infosys team of volunteers took note that we from Infosys were all safe and sound. Good work from the Infy Organizers, in form of transport, snacks and other co-ordinations. It took me around 100+ minutes to close the circuit. Felt happy that I did it, esp. 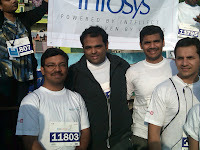 after 12 sitting of chemo, 40 sittings of radiation and living on steroids, for me completion of the race was paramount. Thanks to all my well wishers to have given me the support and enthusiasm all along! It is because of you, that I could do this. Thank you God, for sailing with me all through! Thanks to my parents for everything! Thank you Doctor! It may sound like a Vote-Of-Thanks after winning Olympic Gold medal, for me, this is far more important than any other competition! Recently ordered for some Chinese food from this "Shame" of a place, called Stir-It-Up. Buggers delivered it more than 120 minutes and to top it up, charged for the "Delivery"
Beware of this dirty place. In 1963, after a prolonged duration, finally the Bhakra Nangal Dam was completed and Pt. Nehru was a very proud man. He called his closest ally and one of the chief funding source for the dam, the then USSR Chief Nikita Krushchev to visit the site. On the bumpy and pot hole ridden road from Chandigarh to the dam site, the early morning ride was too much for both the dignitaries. Nikita got disoriented when he saw the sight of people easing themselves on the roadsides in the morning and remarked that Indians – despite the funds and technology transfer are still living outside of civilized world. The visit to dam was not a success as thought by Pt. Nehru. Shortly before his death, Pt. Nehru visited USSR and wanted to see the space research project taking place in Cosmodrome based in Leningrad (St. Petersburg). Again an early morning road ride was taken and Nehru was looking at the straight, 8 tracks and clean roads from Moscow to Leningrad. His aim was to put Krushchev down by pointing one early morning easer and settle the score. Finally Nehru’s prayers were answered and saw one person in his act and promptly pointed it out to his Russian counterpart. Furious about the insult Krushchev orders police to imprison that “predatel”, but police informs that they cannot do it as the person was claiming diplomatic immunity. The early morning easer was Indian Ambassador to USSR! The above may sound like a demeaning joke on Indians, but if reflected upon, it shows what Aristotle is always quoted with – We are what we repeatedly do. Excellence, then, is not an act, but a habit! Either way, let us all get into the habit of doing everything in the excellent fashion!!! Once in a UN General Meeting, representatives of different countries were discussing about the degree of “Freedom of expression” that their citizens enjoy. Though this may seem like a grim joke, the reality is India despite the socio-political corruption leading to economic disaster, India ranks 36 in global Gross National Happiness, while Russia is on 46 and US is on 13. Considering the population of the other two countries, we can proudly say that even 36 is a good index. The reason, why we are what we are – 5000 years of civilization imbibed with grains of philosophical outlook of life, which the other two lack. One is extreme materialism, while the other is extreme atheism. Cultivate that “Nishkama Karma” outlook, half the worries in life will be laid to rest. Long time ago, Lenin, Stalin and Gorbachev were travelling in train. The train suddenly stops due to some snag in deep Siberian Ice Desert. The three are informed that the train cannot make it to the next destination and the crew is waiting for their instructions. The above may look like a simple joke to laugh off, but if you look into it a shade deeper, you can find that three of them had tangentially different perceptions about the same event. Likewise, in our own life we come across different perceptions people carry. We cannot satisfy everyone’s perception every time and we need to strike a balance. Be it our customer, spouse, child, parent, colleague, manager etc. Learn to balance perceptions and go on with your life on your own terms – rather than carrying the burden all through the way. Once a three gentlemen from Britain, France and Russia meet up in a party and topic turns towards – what is meaning of Joy. Of course, this sounds like a joke on Communist Russia, but a dig deeper, you can see that Joy is being defined by different people differently. There may be many who might be happy to see the sun raise today morning, there are many who might be happy to just have something in their stomach yesterday night. The only thing that matter is “Count your blessings”, misery is around is too much! Thank God, none of these Countries are role models for India. I hope and pray that India will never ever become any where close to these Countries. God bless and Save Indians..
13. A lobbyist in New Delhi, with a bunch of media morons and a bigger bunch of human rights activists promoting your " cause "
14. The right to talk about secularism, which you have not heard about in your own country ! B. The inefficient and corrupt Indian police force & Bureaucrats !!! E. The selfish Indian citizens, who are not bothered about the dangers to their own country. F. The illogically brainless human-rights activists, who think that terrorists deserve to be dealt with by archaic laws meant for an era, when human beings were human beings. Click the link :-) Happy reading!!!! In general, Gods and Goddesses of Hindu culture when shown in pictures or in symbols - are shown with the Goddess to the left of the God. In other words, female "power" is shown to the left of the male "power". Let us take the symbolism a little futher, by showcasing the duality as "1" (One) for Male and "0" (Zero) as Female. Then the representation of Hindu Gods and Goddesses shows that Female forms enhance the power/divinity of the Male Gods. 01 is equal to 1, while 10 (with 0 to the left of 1) is 10 times power of the simple 1. No wonder, in all prayers, Hindus pray to the Lord and his consort together, than Lord alone. And for long Hindu culture respected women as "aadi parashakthi" or the supreme power. From an evolutionary perspective or worldview, development—the emergence of that which is new—is seen as the greatest good. So during the limited time that each of us has here on Earth, we all have the opportunity to develop, to make a difference in this world through applying our God-given capacity for free agency, or freedom of choice, to our own conscious evolution. No matter who we are, we all have some measurable, not insignificant degree of free agency. And learning how to activate that gift, so that which is truly higher and new can emerge through us, is what makes all the difference. Recently I have had the privilege of travelling on road using the Grey Hound service of US; from Hartford to Washington DC. Contrary to the popular belief in India, that services in US runs on clock and it is always "on time", found that there is no difference between our Red Bus in India and Grey Hounds in US. As a matter of fact Indian Red Bus is a shade better than Grey Hounds. If a service is cancelled at least it is announced in the Public Address System, while for Grey Hound services, no such thing is there... passengers are just left it at that... when you enquire at the service desk, they simply say "I don't know... am trying to reach the driver and am not able to get him online." There is a lot of hallaboo happening around, Earth Hour, where folks on this planet switch off all the electric items for one hour!!! Good idea.. no doubt... But the question here is, "Does India need Earth Hour???" We in India, have some (rather majority of) places, where there is no electricity at all, then where is the need to switch off! Even in the place where there is electric supply, we have power-cuts which are scheduled, like say daily three hours of power-cut. Then with a daily earth hour, do we need another specific "Earth Hour"
This is a fad for the rich and powerful countries; remember they glutton food and then talk of "diet" food and obesity problem. This "Earth Hour" too is a by product of surplus-resources, not for the have-nots. On the United Airlines flight yesterday night, the attendant asking all the passengers to switch off the electronic equipment for flight take off, said the following sentance. "Everything that has the ON/OFF switch needs to be in OFF mode and stowed"
2. Stow away : your "you-know-what" to be stowed away; but where - you decide. " "In olden times, people studies to improve themselves. Today they only study to impress others"
That reminded me of an anecdote from Readers Digest, that I read a long time ago, that in a letter written on papyrus was found in some excavations. In that letter a Roman senator wrote to his friend about his son this way, "He spends more time with his barber than with his teachers." This is a vinyl poster outside a small kiosk in Hyderabad, where Heritage foods is marketing the availability of butter milk. Nothing is wrong in this photo, but if someone who knows both the languages of English and Telugu reads this will make out that the one on the top which is Telugu is not in proper synch with the intent. If it were to be translated it should say #majjiga labhinchunu# where #majjiga# means "butter milk" and #labhinchunu# means "available". However it is a half-translated and half transliterated sentence. It reads "batter milk labhinchunu" where the first part of "batter milk" is transliterated and the second part "labhinchunu" is translated. This is one of the seasons in India, where every parent undergoes tremendous amount of pressure. Called the "Kid's Exam Season". Rajesh has 15 coins and he distributes them equally among his three brothers. How many coins each of the brother gets? "Fifteen divided by Five", pat came the answer - which obviously made me very happy at my teaching capabilities. My wife came there and asked her, "Why is it fifteen divided by five, not five divided by fifteen?" for which the response was "I do not know fifteen (multiplication) table, so!!!" Well, that the life is for you!! Edits: Thanks to Srini, who pointed out the typo - Fifteen divided by five, it should have been fifteen divided by three and same at all the places. Due to my hurry in writing this post (on a hand held device) the typo. Homeopathic practice is based on a single law of therapeutics called the *Law of Similars*. This law states that *a substance that can cause the symptoms of a disease can also cure it*. does that very substance, when therapeutically prepared, not cure that very disease. IMHO - Isn't is nice to see that our age old traditional sayings or scriptures have a lot of signigicance?